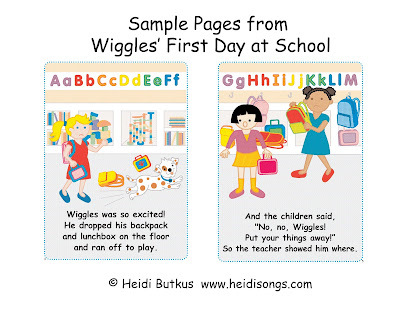 Today I am excited to share a Pete the Cat Match Sets freebie, and also to tell you about my Wiggles book, “Wiggles’ First Day of School.” We have been working hard all summer with one of our wonderful illustrators, Laurel Lane, trying to get this new book just right, and I love the way it came out! 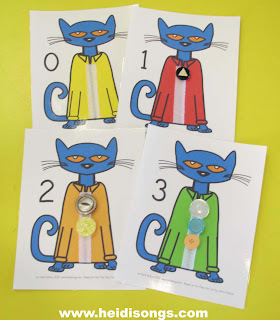 And the Pete the Cat freebie is a good one! More details to follow below. 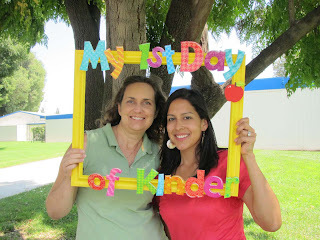 Real quick, how cute is this First Day of School frame idea???? My old job share partner made it for us!! * Putting their own things away rather than leaving them laying on the floor. * Using just a small amount of glue. * Replacing caps on markers. * How to use scissors. * Using quiet voices inside, and saving the loud voices for outside playtime. * Knowing what a “tattle tale” is. * Freezing when the bell rings. * Lining up without running or pushing. * Asking questions about a topic rather than telling stories, etc. And there is even more in this book than the above list- I just tried to include as many different topics and/or scenarios as I could possibly fit into the book. The best part is, it follows the our Classroom Management collection! 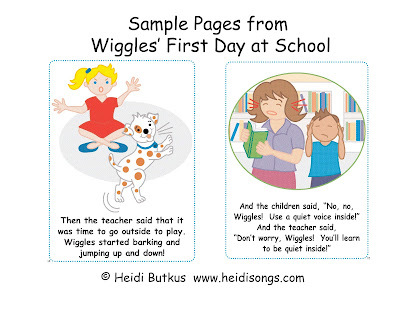 so the songs reinforce the concepts in the story using Wiggles as the “new kid”. 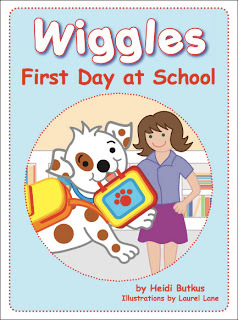 And of course, in the usual fashion, Wiggles gets everything wrong that he possibly can, and the children all call out, “No, no, Wiggles,” and then recite the correct procedure back. 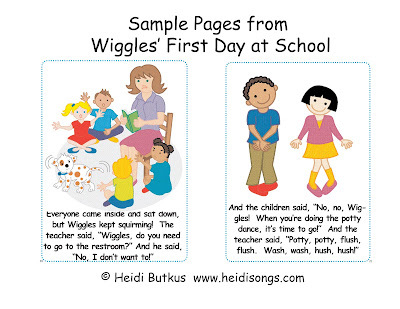 So, when Wiggles uses too much glue, the children all say, “No, no, Wiggles! Just a dot, not a lot!” And so it goes. I will plan on reading and acting out the story with my dog puppet, as I usually do! It’s always lots of fun, and a very friendly way to present the rules and procedures in the classroom. Here are some screen shots from the book to help you get an idea of what it looks like. 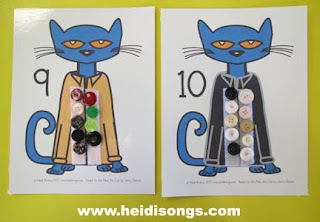 I thought of this project a few weeks ago as I was looking at my Pete the Cat and His Four Groovy Buttons book. I have been trying to stretch my imagination to think of new ideas, and this is one that I am really excited about! I haven’t tried it yet with the kids, but I think it will be great. All you need to do is just print out all of the pages, laminate it, and then put on some velcro as shown. Once that is finished, then you just need to round up plenty of nice, big, bright buttons! Put some velcro on the backs of the buttons, and you are all set to go! I hope that you enjoy this project! I enjoyed putting it together for you. And I didn’t even have to buy any buttons! I just went through my button sorting box at school and pulled out some pretty ones! You do need quite a lot of them, though, so watch out for that! You can download this project here. Back by popular request, I have updated my “Write the Date” pages for those of you that do the calendar book! My district now has so many required programs that I could never hope to find the instructional time for something quite this educational, LOL! So I’ll have to shelve this idea for another year when more freedom is again granted. But it was very little trouble to change the dates to 2018-2019, so here you go! You can download the Calendar Book Pages here. Here are the Write the Date pages!